From the Hancock County Courthouse, go northwest on Hwy 15/16 for 0.6 mile. Stay left on Hwy 16 West at the Hwy 15/16 split. Go 8.8 miles to Green Springs Road (dirt) on right. Turn right (north) on Green Springs Road and go 2.7 miles. 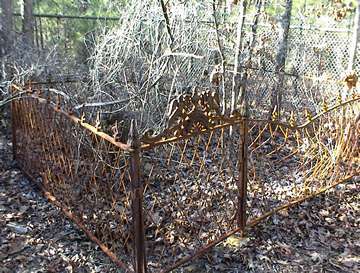 The cemetery is on your left about 20 feet off the road and enclosed in a chain link fence. Note: Green Springs Road is frequently impassable. The cemetery can also be reached from the north. Name is on gate. Grave has no marker.